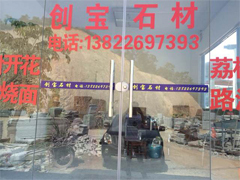 Fengkai county town of duty and bao shi caihang is a collection of its own mining, granite stone, stone block production and processing and product sales for the integration of industrial operation of professional stone enterprises. Companies adhering to the "integrity first, quality first" for the purpose, guided by the scientific concept of development, efforts to improve the utilization rate of resources, improve stone material grade, make new contribution for stone industry. Company's main: sealing flowering (commonly known as: granite, grey hemp, piebold) plate, wool board, fire board, blind road stone, square plate, stair step, pull slot board, litchi board, chop axe, lu yanshi, stair stone, capstone, plaque, corner stone, stone flower bed, lu yanshi, tree (tree ChiShi stone, net-poles, tree box), railing stone, granite, etc all kinds of stone brick stone plate processing and finished products. Is a building, road, square, airports, docks, Bridges, guardrails, such as the ideal garden stone building materials, product not only best-selling domestic market and exported to Japan, South Korea, the United States and other international markets. Welcome new and old customers call advisory!